If I’m not in my barn or my garden, you can find me in the kitchen. When one spends as much time there as I do, one tends to have a few favorite go-to cookbooks within reach. Because of that, here are my current choices regarding some of the best cookbooks that I think homesteaders need. With recipes like Aunt Bee’s Fried Chicken, Opie’s Lemonade Pie, Blue Ridge Mountain Corn Bread, and Thelma Lou’s Neighborly Popovers, you’ll be busy in the kitchen. I love this book and it’s dog-earred and stained to prove it! Chock full of pictures from the TV show, character profiles, and quotes from favorite episodes, Aunt Bee’s Mayberry Cookbook is an entertaining read as well as a book of tasty ideas. Grab your own copy of Aunt Bee’s Mayberry Cookbook here. When we started making our own lard here at Clucky Dickens Farm, I knew we needed a recipe book that would tell us all the great ways to use it. Lard (from the editors of Grit magazine) fit the bill. Grandma’s Homemade Biscuits, Homemade Flour Tortillas, June Cleaver’s Cookies, French Fried Cucumbers, and Pork Pie are some of the recipes that make an appearance here. There are stories and memories from readers, as well as a how to on rendering lard. Great book that we use often. You can find your own copy of Lard: The Lost Art of Cooking with Your Grandmother’s Secret Ingredient here. If you can’t tell by now, I’m a sucker for old recipes. When a friend saw a cookbook called Forgotten Recipes, she knew it was right up my alley and sent it to me. Not only are there really interesting recipes (like 1927 Peanut Butter Bread, 1918 Cream of Onion and Cheese Soup, Strawberry and Celery Salad with Honey Dressing, and 1943 Baked Bean Sandwich) but there are lots of historical facts and tips from long ago. For instance, the inside cover is filled with Household Discoveries: Tips from 1930. The recipes come from magazines from the early to mid 1900s, and most of the included recipes have a year attached to them. A fun read that will help you discover recipes you’ve probably never heard of. You can find your copy of Forgotten Recipes here. Another one of our go-to cookbooks. Full of simply wonderful recipes complied from Old Order Amish cooks by Phyllis Pellman Good. My favorites from this book are Cinnamon Flop Bread, Chicken Corn Soup, Chicken Pot Pie, and Apple Dumplings…but there are so many great recipes here. There are stories and a bit of history from the Amish as well. A great cookbook that you will definitely enjoy using. You can purchase The Best of Amish Cooking here. If you can find a copy of this book, consider yourself lucky. 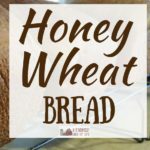 It is where almost all of my bread baking comes from. My hamburger bun recipe? This book. My bagel recipe? This book. Other bread recipes like Potato Bread, English Muffin Bread, or Refrigerator Dill Rolls, that I make but haven’t written about yet? This book. Seriously, you should grab a copy of this Better Homes and Garden Homemade Bread Cookbook. Marie’s grandfather always used to say, “Eat food that remembers where it came from.” So that’s what my blogging friend Marie and her family do. Marie, of Just Plain Living, has put together a huge cookbook to help people use the food that they grow or raise. And when I say huge, I mean huge. It’s over 300 pages—8.5×11″ pages!—and it is packed with almost a thousand recipes. Up until recently, Marie lived deep in the woods, raising four children in an off-grid cabin with solar power, wood heat, and no fridge…and her cookbook is g-r-e-a-t. You can purchase A Cabin Full of Food here. Homesteader Melissa K. Norris inspires folks with practical and easy methods to help them cook from scratch, garden, and preserve their own food. Her book gives lots of information on how to plan, plant, and harvest for eating and preserving. There are also tips on solving gardening problems as well as natural cooking and cleaning methods. Lots of great tips and information in this book! Purchase the Made From Scratch Life cookbook here. So there you have it, a few of what I consider to be some of the best cookbooks out there that homesteaders should add to their kitchens. Are there any you would suggest be added to the list? Add them in the comments! Got to love a fellow cookbook collector. Have 4 of the ones you show plus a shelf full of old family hand me downs and a collection of Amish ones. I haven’t heard of any of these cookbooks before. I definitely need to look for them, because I want to try all kinds of new recipes and expand my cookbook collection.